The Royal Power 6000 watt 12 volt dc to 120 volt ac power inverter with 50 amp charger and automatic transfer switch is a large complete home backup system. The (PIC-6000) can provide 50 amps of alternating power, with this much power you can backup most of your home. This unit includes a hard-wire charger and transfer switch system, with 50 amps of charging current this unit can't simply be connected to a standard home receptacle, it need to be hardwired into two separate circuit breakers. The 6000 watt dc to ac power inverter includes six standard home outlets you can input the full 50 amps of power into any outlet. This unit also includes digital monitoring which can help monitor the battery system voltage and wattage load applied to the unit. 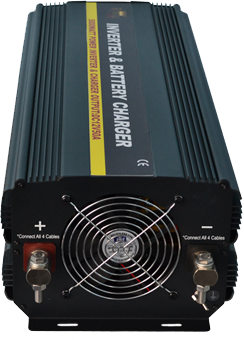 This 6000 Watt 12 Volt DC to AC Power Inverter is specially designed to perform under extreme conditions. This unit can provide over 50 amps of power which gives you the ability to power a large variety of electronics. From all types of battery chargers, TV’s, Power Tool (Power Drills, Saws, Pumps, Vacuums), microwaves, air conditioners, water pumps and air compressors. This unit also includes a hardwire kit that can be used to wire your inverter direct into your fuse panel box.